I am trying to use ConTeXt modes to prepare some text on two displays: screen and print. 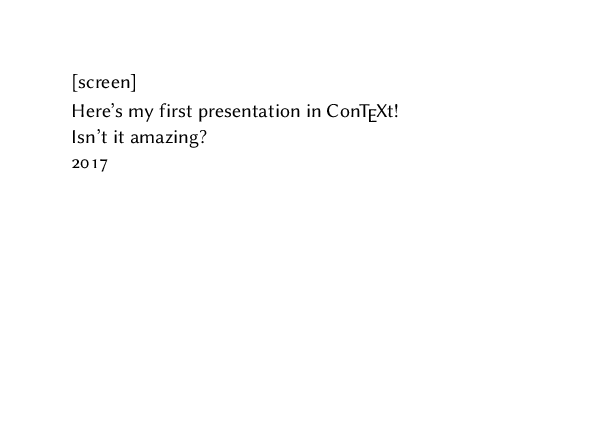 Here's my first presentation in \CONTEXT! When I compile my MWE, I have an unwanted output [screen]. I read carefully ConTeXt reference manual and search the web, but cannot figure why is my output wrong. I tried to introduce several times \enablemode[screen] but it didn't change the output at all. I'm pretty sure I didn't understand something when reading the man and the wiki. where only the start-command takes a argument with the name of the mode but not the stop-command. Not the answer you're looking for? Browse other questions tagged context or ask your own question. How to set output directory in context command? Equivalent settings for pdfdisplaydoctitle	and pdflang in ConTeXt?